TAULIHAWA, March 6: More than a million tourists, including Buddhist pilgrims, visit Lumbini -- the birthplace of Buddha - every year. However, Buddha's natal town Kapilvastu still awaits visitors despite lying just 59 kilometers away from Lumbini. Kapilvastu is home to several sites related to Buddha. But tourists seem to be oblivious to the fact. According to the Lumbini Development Trust (LDT), only 10 to15 percent of tourists visiting Lumbini reach Kapilvastu. Ancient Kapilvastu is considered to be one of the sacred sites for Buddhist pilgrims, where Shakyamuni Buddha spent 29 years of his lifetime. It is also believed to be the birthplace of Krakuchhanda Buddha and Kanakmuni Buddha. The ancient Kapilvastu (Tilaurakot), the capital city of the Shakya dynasty, includes archaeologically important sites like fortification wall, western gate, central structural complex, central wall complex, central pond, eastern gate, eastern stupa, and several other ancient structures. "Kudan, which lies in Kapilvastu, is the place where Gautam Buddha first met his family after his enlightenment," Subedi said. "These historic stories are sure to attract more tourists in Kapilvastu." Although the overall number of tourists visiting Kapilvastu has been low, the number is slightly increasing in recent years, he added. The historical importance of Kapilvastu as a major Buddhist site was substantiated further by the recent archaeological findings of a research led by Professor Yukio Nishamura of Tokyo University and Professor Robin Coningham of Durham University. In their three-year research (2011-2014), archeologists identified several archeological sites related to the life of Buddha. The project entitled 'Strengthening the Conservation and Management of Lumbini' was established and implemented by UNESCO with the funding of Japanese Funds-in-Trust (JFIT). However, Buddhist pilgrims and tourists do not seem to have much information about the area. Sharmila Tamang of Kathmandu, who was touring Lumbini last week, said that she was attracted toward Lumbini by the Mayadevi Temple. "I saw photos of white temple on the Internet. Me and my friends do not know Buddha's palace lies in Kapilvastu," she added. 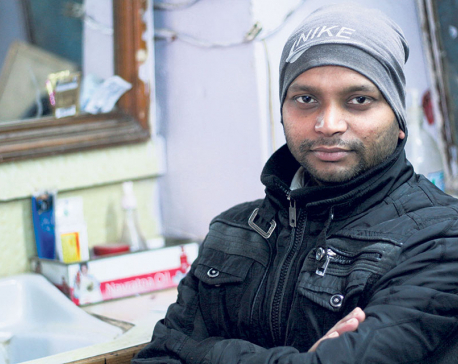 Shivaraj Sharma, a tour guide in Kapilvastu, said very few people come to visit the sites around Kapilvastu. "Travel agencies are also not including these places in their itineraries. Also, things to show to tourists are not kept properly like in Lumbini. If we preserve and promote these sites like the Mayadevi Temple in Lumbini, it could attract large number of tourists," he added. "Our job is to protect and preserve heritage sites that are under the Lumbini Master Plan," he added. Of late, tourism entrepreneurs have realized the need to promote Kapilvastu and develop a greater Buddhist Circuits trail. 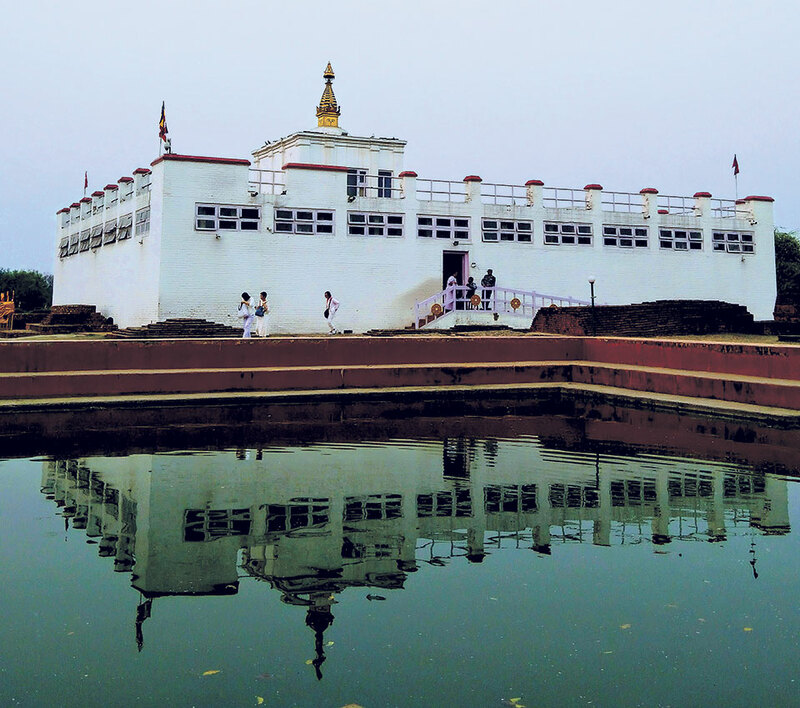 Bikram Pandey KAJI, who has been promoting Buddhist Circuits tourism for the past few years say, average stay of foreign tourists in Lumbini is just around 42 minutes. "This is because foreign tourists do not know about the domestic Buddhist Circuits," Pandey said. "In the lack of proper information, foreign tourists do not go to Lumbini. They are not aware of the religious and archaeological value of the place." "We have much more to show about Buddha's lifecycle in Kapilvastu," Pandey said. "We are already working to develop and promote domestic Buddhist circuits. We believe it will increase average stay of tourists in the Lumbini-Kapilvastu region." UNESCO gave World Heritage status to Lumbini in 1997, confirming claims that Siddhartha Gautam, who later became Buddha, was born in 623 BC in the Chittalata forest of Lumbini. The major attractions of Lumbini are Mayadevi Temple, Ashoka pillar, Pushkarini Pond, and several monasteries built by Nepal and other countries. Besides these attractions, there are plenty of other Buddhist attractions like Gotihawa, Kudan, Tilaurakot, Niglihawa, Arorakot, Sagarhawa, Sisaniya, Devdaha and Ramgram in the Lumbini-Kapilvastu region that can be included in domestic Buddhist Circuits. According to mythology, out of 24 Buddhas born so far, three -- Krakuchhanda Buddha, Kanakmani Buddha and Shakyamuni Buddha -- were born in Nepal. Kapilvastu has the evidence of all three Buddhas' life. Similarly, among the 40 pillars of King Ashoka, three were built in Lumbini, Gotihawa and Niglihawa as evidence of the lifecycle of Shakyamuni Buddha, Krakuchhanda Buddha and Kanakmani Buddha, respectively. "Targeting to bring more tourists, we are promoting greater Buddhist Circuits that includes all the Buddhist sites of the country," Pandey told Republica. Furthermore, Buddhist pilgrims and tourists from several countries are expected to land directly in Lumbini once Gautam Buddha International Airport comes into operation, Subedi of NTB said. The government is spending Rs 700 million to continue works as per the Lumbini Master Plan, according to LDT.